Patients in the centrifugal-flow group had less frequent reoperation for pump malfunction compared with the patients in the axial-flow pump. HealthDay News — A magnetically levitated centrifugal continuous-flow circulatory pump was superior to a mechanical-bearing axial continuous-flow pump at 2 years for patients with advanced heart failure, according to a study published online in the New England Journal of Medicine. The research was published to coincide with the annual meeting of the American College of Cardiology, held from March 10 to 12 in Orlando, Florida. 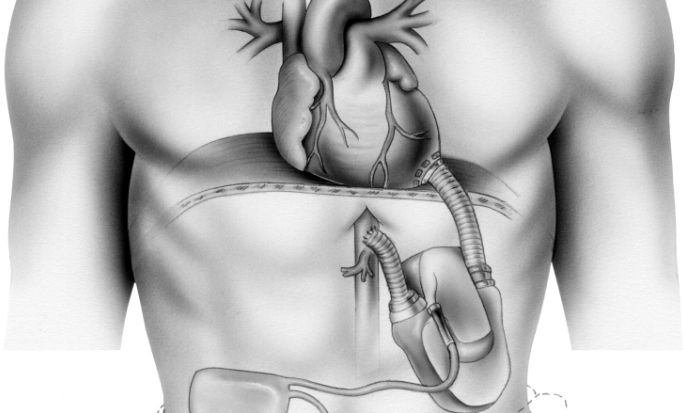 Mandeep R. Mehra, MD, from the Brigham and Women’s Hospital in Boston, and colleagues conducted a randomized noninferiority and superiority trial comparing the centrifugal-flow pump (190 patients) with the axial-flow pump (176 patients) in patients with advanced heart failure. The researchers found that the primary end point (composite of survival at 2 years free of disabling stroke or survival free of reoperation to replace or remove a malfunctioning device) occurred in 79.5% and 60.2% of the centrifugal-flow and axial-flow pump groups, respectively (absolute difference, 19.2 percentage points; 95% lower confidence boundary, 9.8 percentage points [P <.001 for noninferiority]; hazard ratio, 0.46; 95% CI, 0.31-0.69 [P <.001 for superiority]). Compared with the axial-flow pump group, the centrifugal-flow group had significantly less frequent reoperation for pump malfunction. “In patients with advanced heart failure, a fully magnetically levitated centrifugal-flow pump was superior to a mechanical-bearing axial-flow pump with regard to survival free of disabling stroke or reoperation to replace or remove a malfunctioning device,” the authors wrote. Disclosures: The study was funded by Abbott. Mehra MR, Goldstein DJ, Uriel N, et al. Two-year outcomes with a magnetically levitated cardiac pump in heart failure [published online March 11, 2018]. N Eng J Med. doi: 10.1056/NEJMoa1800866.